Hidden from view until now – fluid filled spaces everywhere! A medical group from New York City recently discovered something very new and interesting about connective tissue. 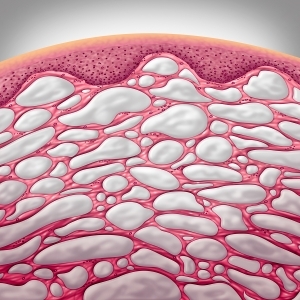 Connective tissue (or fascia as it is also known) is the tough, gooey, elastic filler stuff between cells in and around tissues, sinews, organs and muscles of the body. It is simply everywhere! On one hand, this material is the foundation of our physical being. It is the essence for cohesion and the structural integrity between all our cells; but more, it is the very matrix that confers vitality and capacity for many (if not all?) of the body’s basic functions. As with many good discoveries, it came unexpectedly while focusing on something else. A patient’s bile duct was being examined looking for signs of cancer, but what was really seen were mostly fluid-filled cavities among a network of connective tissue fibres– this is not normal! But maybe….. it is! Indeed, the newer methods the team were using allowed them to see connective tissue as it really was for the first time. The default older methods had been unknowingly removing the fluid from biopsied tissues. Normal connective tissue (until now) was expected to appear as a network of dense layers stacked together (NOT like the diagram shown above which has many little pockets of vital fluid). When the group looked elsewhere with their new techniques, all they could find was connective tissue that possessed micro-sized fluid-filled spaces intermittently lined with special cells within the mesh of the connective matrix (similar to the diagram shown above). Why is this so important you ask? Well, first of all it may account for the large amount of “missing” water in the body that did not compute before from the perspective of adding up the known reservoirs within all the tissues. But more importantly, these micro-pockets of fluid are not just water, they likely represent the delicate initial first critical control point in the body as it directs resources and vital functions, from repair and healing, defense and immunity, and physical integrity. The fluid in these spaces are communicating and then flow directly among the matrix of the connective tissue, much like the water flows through a healthy vibrant swamp, percolating with rich capacity to nourish, detoxify, purify, and enrich. This finding may be very fruitful for the science community to investigate and better understand the mystery of why some disease processes happen, how the body fights some diseases, and of course, new possibilities to treat some diseases. It also has important implications for understanding mechanism in manual therapies like massage, and yes, acupuncture, both of which focus on the fascia if not more than the muscles (see research discussed later in this blog). So novel and critical is this finding that some are declaring it should officially be haled a whole new organ system called the “interstitium”! If so, this would be the largest organ in our body by weight (especially with all the extra fluid found! ), right there all the time, overlooked and under-appreciated for decades. They published their findings as a scientific report in the prestigious journal Nature. It may be a bit technical for many to read, but nonetheless, the pictures comparing the old and new ways to visualize the micro-structure say a thousand words (The “Structure and Distribution of an Unrecognized Interstitium in Human Tissues”). Indeed, science’s biggest gains have been made through reductionist thinking, understanding the world as a sum of its parts, like a machine or computer. Powerful indeed! Few could refute that the scientific process to discover and observe and explain how the universe fits together and interacts. This way of thinking has been technically superior beyond any other system previously to control and manipulate the material world. It has given humanity unprecedented material wealth and security, even if it has also given us many effective ways of doing harm to each other and the planet as well. Below at the bottom of this blog, we document for you the fascinating and emerging science story of connective tissue and why it is so important (read it, it is awesome how critically important this material is). Surprisingly, even to us science sorts at The Acupuncture Turning Point with lots of science degrees, the most amazing thing going on about this interstitium discovery is the wonder and prescient insightfulness of oriental medical. How ancient philosophers and healers used inductive reasoning to gain insight and make some accurate generalizations about the interstitium organ centuries ago is impressive (what we believe they were doing with their San Jiao system). This is similarly abstract in quality to what Einstein did as a young man with his thought experiments regarding relativity (imagining what it would be like to travel at the speed of light on a photon); with little or no technological ability to investigate the unseen world, through their observations of the nature of the human body, oriental thinkers made good functional generalizations and theories about patterns of the flow of yin (fluid and substantial materials) and yang (energetic, vital processes). They came to develop systems to understand the body from a relational point of view, as an ecosystem or network to explain the movement of energy, nutrients, water, pathogens, etc. Reductionism; powerful but bit bulky and blind to see the forest through the trees sometimes! Science’s default bias makes our knowledge of nature (and our body and mind) very fragmented and bulky and not necessarily able to predict the whole as much as we would like. It is difficult, if not impossible, to coordinate and synthesize the growing immensity and diversity of our information systems back together into a clear and cohesive functional story. The whole is greater than the sum of the parts, indeed, and many scientists have documented and discussed this phenomenon called “emergence” (https://en.wikipedia.org/wiki/Emergence). So, not only are we blinded by the shear volume and speed of new information coming at us, but we are also becoming more and more short sighted due to the necessity of becoming professionals over ever narrowing expertise in order to continue the pursuit of more nuanced and detailed information. But some things simply cannot be predicted or visualized easily from the bottom up! Take for instance how we are fundamentally limited in predicting the weather, global warming, and big picture ecosystem phenomenon (like the subtle inner workings of the body). We believe the San Jao system described more than two thousand years ago to be the analogue of the interstitium as it has recently been described. As students we were taught that the San Jiao was an organ along with the other organs, although it was not like the other organs — instead of a discrete thing without a clear physical description, it was said to be a container in which the other organs are stored, and was divided into the upper, middle and lower. Unlike the other organs also documented by the ancient texts (i.e. heart, liver, lungs and kidney, etc), it was very confusing for us to translate this concept into English. Although we could make parallels other organs described by western medicine, we could not explain this mystical organ rationally. So at first we just memorized the concept without really understanding it. Ancient oriental texts speak of meridians (unobserved and unsubstantiated by science) which conduct the flow of “Qi” (also unsubstantiated by science). Meridians are considered networks conducting the flow of yin and yang substances throughout the body and to the organs in a circulatory pattern – so its more than blood and fluids. It is vitality and functional capacities of the body. Although the details of oriental theory do not agree with scientific understanding of the flow of blood and fluids and energy in the body, elements of the theory regarding the San Jiao may possess fascinatingly insight. It appears the ancients were describing details of the interstitium and the role it plays in fluid movement between cells, and its other multiple functions. Ancient oriental manuscript descriptions of the San Jiao. Oriental medical texts, including the ancient Huang di Neijig which is over 2000 years old, said that the San Jiao meridians governed various forms of energy, and served as a passage and distribution for the flow of an important and critical essence in the body, as well as body fluids. Now remember, unlike the heart or kidneys, there was no organ they could perceive, and this was all inferred inductively. One ancient translation to English states the San Jiao “is located separately from the organs and (is) inside the body.” “It is the irrigation official who builds waterways”. “The upper energizer like a fog”. They also described an important connection of the San Jiao back to the heart – wow! 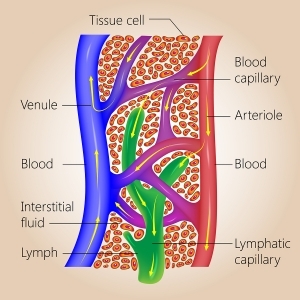 Indeed, fluid from our interstitium becomes lymph, which trickles (3 L per day total) through lymph vessels, and ultimately dump all the lymph into the largest vein of the body just before it enters the heart. Also, acupuncture points along the meridians were traditionally used to stimulate what they described as an immune system (the Wei Qi), and to treat different types of inflammatory processes, especially located in ear/throat/nose and when edema was present. Bang on again! 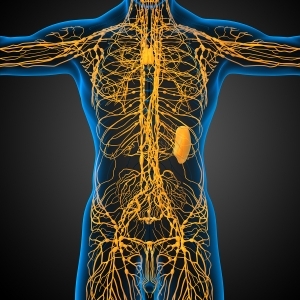 This concept is closely aligned to functions of the lymphatics, regarding the foundation of how the body monitors foreign things and mounts an immune response. Gas exchange: It is where oxygen and carbon dioxide gases exchange between all cells and the blood supply. Nutrient and waste transport: All nutrients (sugar, fats, amino acids, vitamins, metal ions and salts) that need to transport to cells or wastes that need to be removed from cells diffuse through the interstitium. Chemical and hormone communications: hormone and chemical signaling systems that allow cells and organs to communicate so the body metabolism can be controlled and coordinated, flow through and react with the interstitium. Physical integrity of the body: Structurally, the connective tissue of the interstitium gives our body suppleness and integrity. Each connective tissue of the body is comprised of various special materials, depending on its needs, representing a mesh of tough collagen fibers, elastic elastin fibers, and an important filler carbohydrate granular material call the ground substance that is a mucous-like gel that binds all the fibers together. For decades now, we have known that the fascia, or structural part of the interstitium, connects every cell, to every tissue, organ and body part and is the foundation of our body’s structural integrity. Although the new discovery of fluid filled cavities could be seen as a physical shock absorber, the connective tissues have been centrally important to many in the manual therapy sciences like massage, Rolfing, acupuncture, and osteopathy or any therapy that focuses on myofascial treatments (i.e. muscles and connective tissues around and between). Immunity and defense matrix and conduits: To understand the implications of the fluid-filled spaces as the foundation of our immune system, we need to understand something about the lymphatic system. The interstitium is the beginning of the local drainage system, as described earlier like a health swamp with vibrant capacity when it is no stagnant; here a small amount fluid leaves from the plasma of blood from capillaries in tissues, percolates between all the cells, and then becomes lymph that drains back through the lymphatic vessels, through all the lymph nodes, and ultimately dumping to the vena cava, the largest vein in the body returning blood back to the heart – in total about 3 litres of lymph fluid circulates this way per day. This is compared to the more than 4000 litres a day of circulating plasma fluid that circulates each day in blood via the cardiovascular system. So this means only 0.07 % of the blood plasma “leaks” out of blood vessels in the tissue (little capillaries) to percolate through the interstitium, coalesce into the fluid filled cavities, which then may directly connect to lymph vessels to the heart. 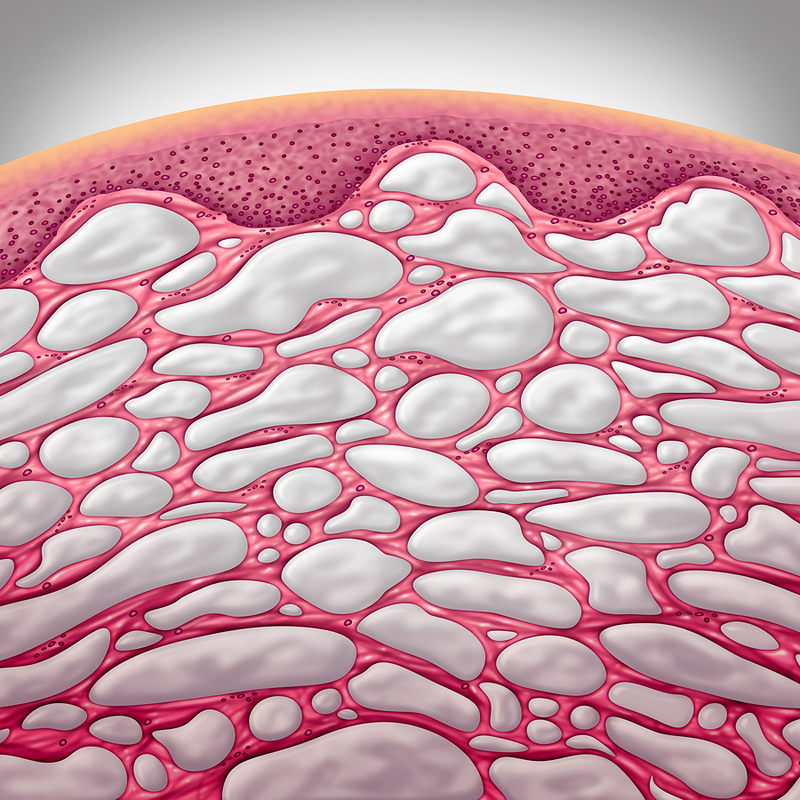 This discovery about the fluid filled cavities in the interstitium may open doors to understand how cancer spreads from an original site, how inflammation initiates to heal or harm, and how all this affects the stream of events down the lymph to lymph nodes (where white blood cells are waiting and monitoring the lymph for signs of cancer or disease), and ultimately back to the heart and blood circulation, where the cycle perpetuates itself. With acupuncture and manual therapies, it is all in the fascia! Scientists from the University of Vermont College of Medicine have focused on understanding how traditional acupuncture points relate to the tissues below. They noticed that the important acupuncture points historically all are in connective tissue and not muscle. (Relationship of acupuncture points and meridians to connective tissue planes, Langevin and Yandow, 2002, The Anatomical Record banner https://onlinelibrary.wiley.com/doi/full/10.1002/ar.10185). The idea of acupuncture meridians in the arms and legs described in oriental medicine closely align with connective tissue planes. Acupuncture points, more or less, very closely align to the convergence of connective tissue planes. 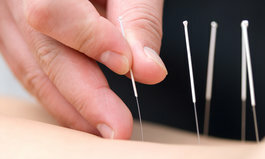 When an acupuncturist turns the needle and creates a grab on the needle called “de Qi”, they used ultrasound imaging to visualize this as the tissue winding and/or contraction of fibroblasts (connective tissue cells) surrounding the needle. Concept of Qi: The sum of all body energetic phenomena (e.g. metabolism, movement, signaling, information exchange). Blockage of Qi (a key concept in traditional acupuncture for imbalance of health): Altered connective tissue matrix composition leading to altered signal transduction. The propagated of the de qi sensation along the arm or leg: The wave of connective tissue contraction and sensory mechanoreceptor stimulation along connective tissue planes. The restoration of flow of qi: The cellular activation/gene expression leading to restored connective tissue matrix composition and signal transduction. 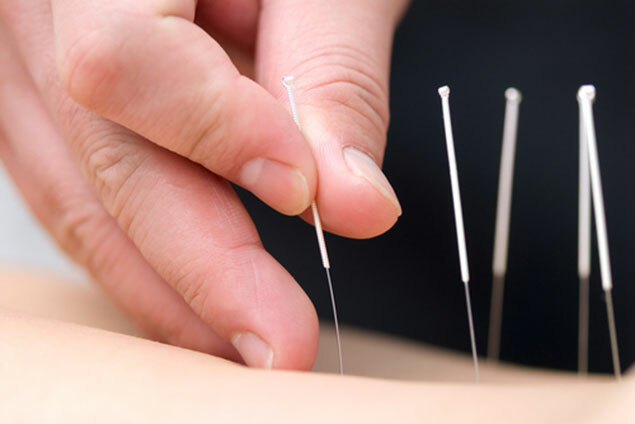 Other effects investigated by scientists acknowledge that acupuncture may represent a micro-trauma which has a therapeutic effect through biochemical, bioelectrical, and physical responses of the body. 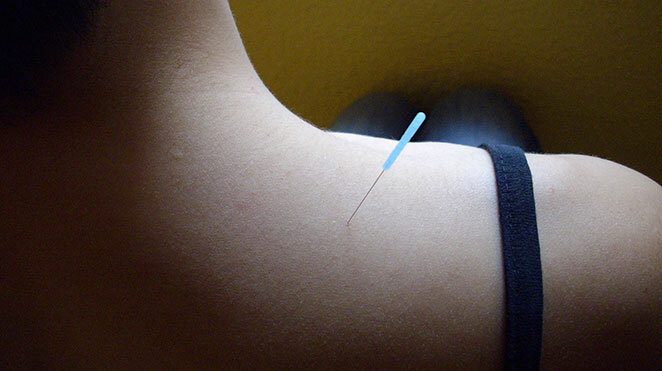 Here the small discreet tissue damage caused by an acupuncture needle in a specific location in connective tissue may result in a healing response that has impacts beyond the local area. In “The tensional network of the Human Body” by Schleip, Findley, Chaitow, and Huijing, a very extensive text published in 2012 by Churchill, Livingstone, Elsevier, they discuss potential therapeutic effects of manipulation of the fascia that likely apply to acupuncture and other manual therapies. Local fibroblasts (which generate the matrix of the connective tissue) act to repair or breakdown the fascia of organs or tissues; mast cells, rich in heparin and histamine, and actively participating in immune defence and blood flow are activated; fat cells, which participate in endocrine function produce estrogens, regulating insulin/glucose levels and appetite. Sympathetic nervous system activation (“stress” response) may increase production of cytokines to change pH and increase fascial tonus. Acupuncture acting on free nerve endings located in the fascia may able to decrease sympathetic effects and relax fascia, restoring pH and decreasing production of cytokines simultaneously. Fascia is a complex mechano-sensory system. The interaction of fascia and associated water to “remember” its geometric orientation and signal to the brain if fascial distortions are formed. 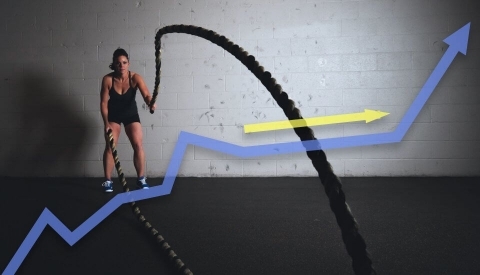 These distortions can take a shape of a trigger band, tectonic fixation (loss of gliding ability) or different types of multidirectional distortions which formed as result of injury, poor posture or metabolic imbalances. Distortions cannot be diagnosed by mainstream medicine, because even MRI studies will not show these changes in gross architecture since they are the same density and thickness as normal tissue. They are only seen on biopsy. They are often unresponsive to drug therapies. But manual therapy and especially acupuncture can play a significant role in restoring fascial homeostasis. So the functioning of the interstitium/fasica/connective tissue matrix is critical for our health and vitality. For this reason, it is also a key place to look for clues in disease and health for future scientists. So much of research has and will continue to genetic in nature and on cell function….but hopefully this blog will help you appreciate the spaces between the cells, whatever you want to call this tough, gooey, elastic filler stuff between, in and around the tissues, sinews, muscles, organs and indeed, every cell of your body! "My Shoulder Pain is Gone!" "Treatment for back pain & PMS"
"I've been seeing Gord for acupuncture on a regular basis for a number of months. The clinic is very comfortable and Gord always takes time doing a holistic assessment and always asks how things worked out. He really knows his stuff, explains what he's doing and asks for your input. The best part is-it works! I've seen large improvements in both my back pain and PMS" K.K. "I was in to visit Alina to see if she could help with a shoulder injury that I had incurred while in the gym, well the results were immediate and quite impressive. The pain in my shoulder subsided and I experienced my first restful night in weeks. Thanks Alina" - Brad D.
"It was my first time going to acupuncture and I was really nervous about it, but Gord made me feel at ease and made the whole appointment really relaxing and fun! I learned a lot about my specific needs and why he chose the specific acupuncture sites he did. He has an awesome, positive energy and his optimism for healing is contagious" N.E. "Helps manage pain from spinal cord injury"
"I have spinal cord injury. I suffer from neurological pain and spasticity related to my disease. The tangibles have been reduced pain, increased range of motion, positive sensory changes, and an ever increasing list with each week. Gord has become a true member of my health care team" T.F. "Dr. Gord Grant was incredible. Extremely perspeptive and understanding, I could immediatley he was knowledgeable regarding menstrual migraines, and other women's health issues, which is rare for male practitioners. I am looking forward to going again soon, and increasing my own awareness of my body and well being" Pam C.
"For a chronic health condition I have, acupuncture has helped me the most. I feared being unable to find community acupuncture, something I had been very fortunate to benefit from previously. Their sliding scale rate and welcoming reception really encouraged me to come in. The treatment I received was excellent and I am very much looking forward to continuing to attend. Thank you." - A.B. We are highly trained professionals, specialists in various techniques and holistic approaches. Confidentially, with your permission, we share relevant information and discuss your progress to provide insights, support, suggestions and referrals in your best interest. "At my first time facial treatment, Jennifer made me feel comfortable and was very gentle with the needles. My skin felt wonderfully soft and smooth after the clay mask and massage treatments. The subtle aromatherapy from the essential oils was pleasant and uplifting. I left feeling refreshed and rejuvenated. I would highly recommend this treatment to anyone!" S.G.
We create a healing environment which is individualized and consistent with your values and goals. 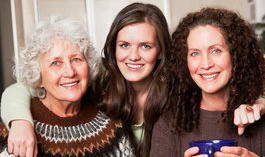 Many factors in your health are evaluated, including lifestyle, diet, life stresses, as well as specific symptoms. Treatments are tailored to your unique situation, changing with you. "I never tried acupuncture before and I am very glad that I went to "The Acupuncture Turning Point". Acupuncture treatment provided by Dr. Grant is helping me. Acupuncture was my last resort to treat insomnia and it is working. Dr. Grant is very professional, personable and will adjust the next treatment according to your feedback" S.J. "Stepping into a Transformative Experience"
I have been involved wiith alternative, holistic approaches to medicine for twenty-two years...Gord Grant provides a unique service: soothing in atmosphere, one instantly feels taken care of. Gord's care and personal investment into his patients is a gift to experience. Gord treats his patients so they can become balanced and integrated as a human being again. S.M. "I have had only 2 visits and already have increased mobility in my neck. I suffered from two accidents that left me with headaches and a very stiff neck. I can't believe the transformation! 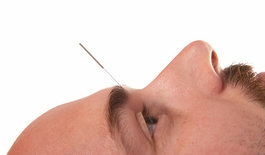 I recommend anyone suffering with any type of discomfort to try acupuncture. You will gain intelligence and freedom to live a pain free balanced life" M.S. We complement, rather than replace, conventional western medical treatments. We use traditional and modern methods that activate and support the body’s natural, adaptive mechanisms to improve the rate and extent of healing.